Nestled in the "Valley of the Ten Peaks" in the Canadian Rockies is a sparkling, crystal clear, glacially-fed lake of surpassing beauty. Lake Moraine languidly awaits anyone willing to journey to an elevation of approximately 6,183 feet above sea level to enjoy its pristine blue waters and the magnificent views of Alberta, Canada's Banff National Park. 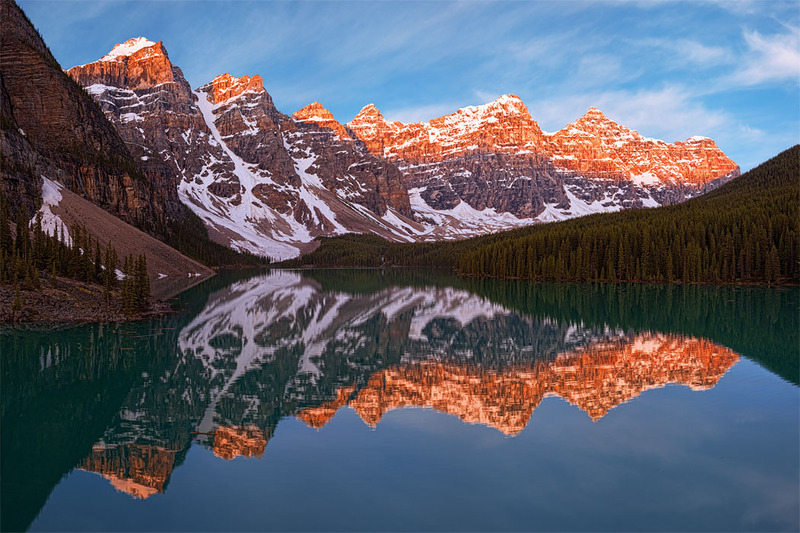 This image captures the burgeoning sunrise of a late June morning over Moraine Lake. This illuminating photograph captures first light breaking, and the warming colors striking, the majestic peaks of the third highest mountain in the Rockies. Not to be outdone, this iconic lake brought its own game, adding to the amazing lighting by reflecting from its placid, teal-blue waters.